"Dieb13 vs Takeshi Fumimoto" - two unequal characters, redefine the relation between computer and turntables, between digital and analogue electronics. Takeshi Fumimoto means turntable-improvisation at it's best: he works up various vinyl records, all of them featuring turntables or vinyl music themselves, mashed to a 16minutes piece showing the essence and sonic possibilities of todays experimental turntable music. Dieb13 performs the task of breaking in on Fumimoto's work with remixes. Using self written audio software and focusing on the (often microscopic) structures of Fumimoto's output, he manages to transfer the given sounds into new contexts and cast a surprising light on them. The resulting 31 minutes of music, sectioned in 12 tracks, seamlessly nested into each other, are astonishingly homogenous, yet rich of variations and surprising twists. Both - Dieb13 and Takeshi Fumimoto - have been active in Vienna's electronic and Improv music scene since the mid 1990s with solo works and various collaborations. Dieb13's appearences include more than 20 releases on numerous labels. Playing turntables or computer in most of his musical works, he has also been active in such greatly different fields as net activism (e.g klingt.org), video works, theater, opensource advocacy/programming or sound installations. Takeshi Fumimoto's turntablism can be found on Amoebic's legendary "turntable solos" compilation from 1999. Live appearences include collaborations with Billy Roisz and Otomo Yoshihide. 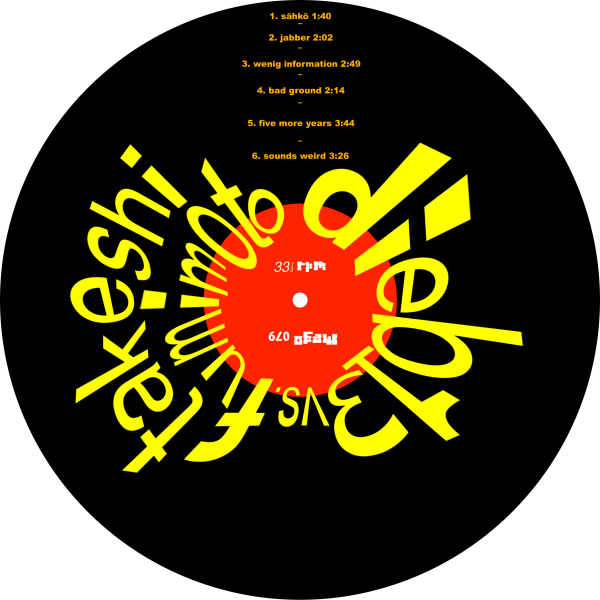 "Dieb13 vs. Takeshi Fumimoto" is the result of more than a year of work, and is released as colorful vinyl Picture Disc, limited to 500 copies under the creative commons sampling+ license.